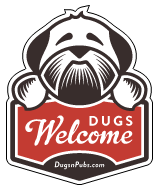 Dog Friendly Pubs, Cafes, Shops & Accommodation in Edinburgh’s Old Town, Scotland. We are a diner, cocktail bar, coffee house and pop up barber shop. We pride ourselves in the authenticity of our east coast street food. From our already famous Philly Cheesesteak, our New England Lobster Roll and Reuben Sandwiches to the New York Strip Steak, Clam Chowder, classic salads, hand pinned pizzas and oversized hot dogs, we have something for everyone. Dogs of any size, colour and breed are welcome in Cranachan & Crowdie. A unique Scottish retail experience in Edinburgh stocking fine food, drink and gifts, including specially curated items for you and your dog. Open daily 11-6. Mama Said is a convenience store selling grocery, alcohol, confectionery, tobacco products and lottery tickets. You can meet the resident dug Mr Randolph Mortimer. A great little traditional pub in the Grassmarket area of Edinburgh. There are a total of 53 dog friendly listings in the Old Town category. Please log in, or sign up as a member to view all listings.